At Thanksgiving this year, I set out to recreate my favorite holiday flavors as vegan dishes because I’d invited my sweetheart to join my family, and as far as I’m concerned, the way you love someone is to respect their personal choices in support of their health. That being said, there is absolutely no reason that creative people must suffer through anything less than the yummiest of foods. You truly can have your vegan, gluten-free cake, and eat it too! Yes, we made a ham and deviled eggs for the omnivores, but on the side-dishes, going vegan was not only easy to do, but stunningly delicious! Necessity is the mother of invention! 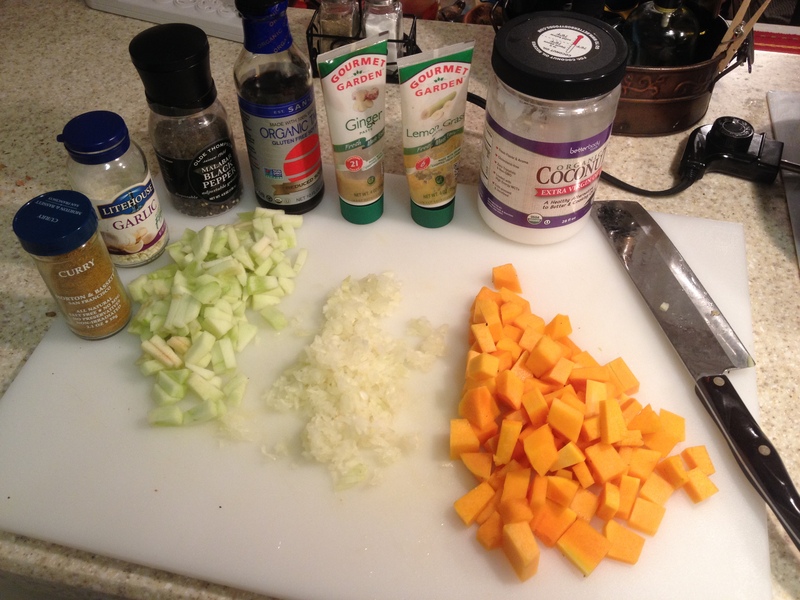 I started this “Thai Autumn Squash” recipe as an answer to the age old “sweet potato casserole” requirement we seem to have in my family. I have never liked that dish, floating in marshmallows and cloyingly sweet. So, I began with the basic idea in my Autumn Harvest Bisque recipe, but rather than a soup, I aimed for a whipped and baked in a casserole dish idea. 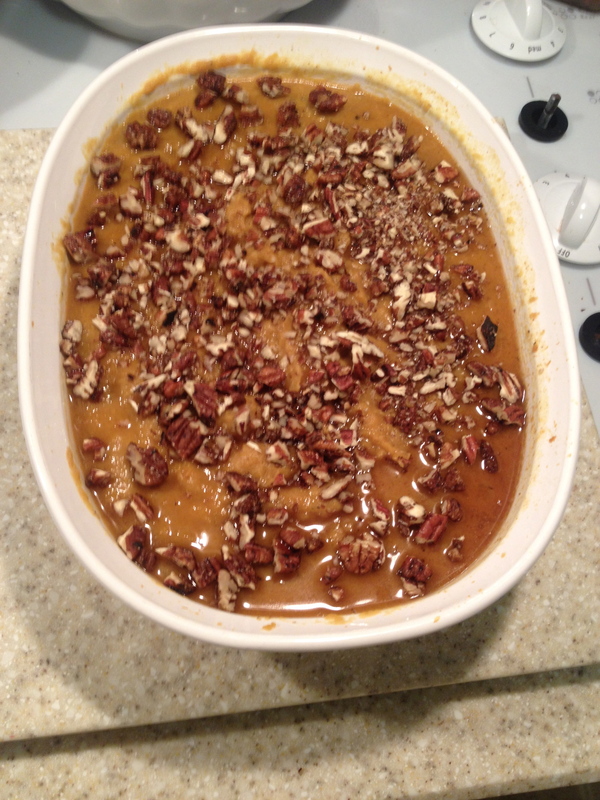 Plus, my sweetheart made some amazing tamari roasted pecans that I used as a topping! Pull out your electric mixer, if you have one. Ahead of time you can mull some apple cider by slowing warming on the stove, or in a crock pot, a gallon of apple cider with 1 tablespoon each of whole clove, whole allspice, and an orange peel, with 1 cinnamon stick. Let soak for a few hours, then remove the spices and enjoy as a warming holiday beverage, but save out 1/3 cup for the squash! Prepare your Sweet Tamari Pecans ahead of time, according to this recipe over at Lipbone Redding’s blog, but try not to eat them all! Save about 1/2 cup for the squash. Autumn squashes are notoriously tough and difficult to peel. I think it is easiest to just prick the skin of the butternut squash with a fork a bunch of times, then put in the microwave on a plate, and cook on high for 5 minutes, then give it a cold bath in ice water. After it has cooled enough to touch, the peeling should strip away with a vegetable peeler pretty easily. Cut in half, scoop out and discard the seeds/pulp, then dice up the remaining squash. 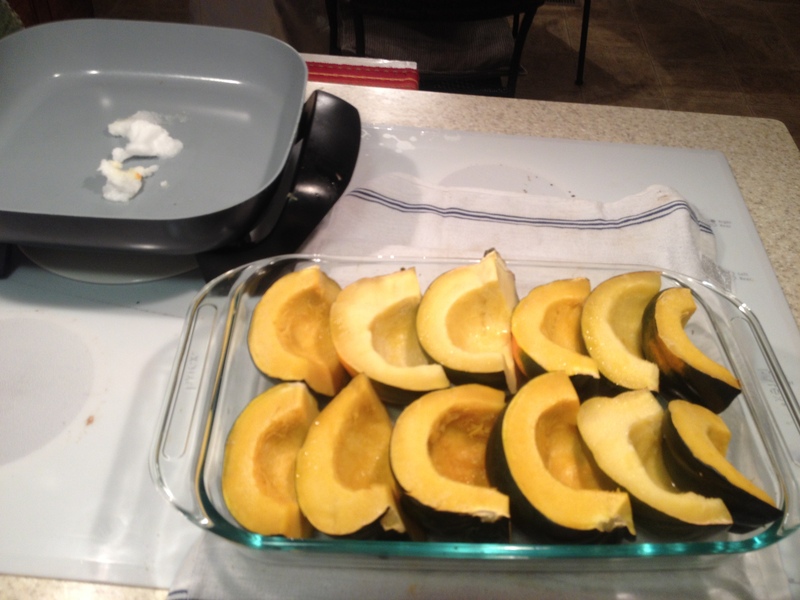 To prepare the acorn squash, I quarter them, scoop out and discard the pulp/seeds, then place raw side up in a casserole dish with about a 1/4 inch of water in the bottom, cover with foil, then bake at 350 degrees for about half an hour. Remove from oven, let cool. I then use a spoon to scoop out the squashy goodness, discarding the peels. Go ahead and peel/chop the apple, garlic, onion, ginger and lemongrass. In a large, deep skillet, (I used my electric skillet) heat up the coconut oil over medium high heat and saute the onions until glossy, then add the acorn and butternut squash. Saute for about 5 more minutes, then add the apple, garlic, curry, ginger and lemongrass and the mulled apple cider. Reduce heat to medium, and stir frequently for 5-10 more minutes as the liquid reduces and it caramelizes a bit. It is done when the apples are mashable.Remove from heat and transfer to a mixing bowl, get out the electric mixer, if you have one. Preheat the oven to 350 degrees. With the electric mixer, whip the vegetable mixture with the coconut milk, tamari sauce, black pepper and berbere powder (or paprika) until smooth and fluffy. Taste-test and adjust salt and pepper to suit your preference. Spoon into a casserole dish and smooth flat. Sprinkle the chopped sweet tamari pecans evenly over the top, then drizzle the maple syrup over the top. Bake at 350 degrees, uncovered, for about 30 minutes. VOILA! This recipe served 6-8 people with left-overs. See also my Vegan Recipes: Marinated Collard Greens post. This entry was posted in Life, Vegan Recipes and tagged acorn squash, butternut squash, curry, gluten-free, holiday, recipe, Thanksgiving, vegan by Heron's Rook. Bookmark the permalink.